We’d love your help. Let us know what’s wrong with this preview of Escaped by J.C. Mells. FYI: Due to recent changes on Amazon, I've had to change this former Book 1.5 to be Book 2 now. (They've got rid the 0.5s) The book cover still says 1.5 on Goodreads until I can change it! Oscar Alvarez de Sevilla was living the American dream. Attending a prestigious law school in New York City and madly in love with the girl downstairs, who he was pretty much going to mar FYI: Due to recent changes on Amazon, I've had to change this former Book 1.5 to be Book 2 now. (They've got rid the 0.5s) The book cover still says 1.5 on Goodreads until I can change it! To ask other readers questions about Escaped, please sign up. Fantastic follow on to Book 1 'Pierced'. I loved this book, and the new characters that we have heard of previously but now get taken into their world. JC Mells brings people to life in her books so well you feel you know them! I have ordered book 3 straight away, I can't wait to see what happens next! Just brilliant! Great prequel to Pierced. Explains a character we never met, but knew was all important in Pierce's life. Loved how it jumped in times, it was done really well. This is a great author and a great series. Can't afford book 3 just yet, but I can't wait to buy it. If you enjoy a tense plot, a bad girl, a bit of romance, and a pinch of magic, this series is for you. I picked this up a few days after I finished Pierced. This novella lends a bit more back story to the events that lead up to what happens in Pierced. Escaped is a dual story, with the narrator, Oscar, telling how he aided Pierce and Mia’s escape and the story of his love, Sarah. I liked this story a lot. The duality between the two plot lines was interesting to me. Oscar would recall something between him, Reyes and Sarah and it would be reflected in the present time actions of Pierce’s and Mia’ I picked this up a few days after I finished Pierced. This novella lends a bit more back story to the events that lead up to what happens in Pierced. Escaped is a dual story, with the narrator, Oscar, telling how he aided Pierce and Mia’s escape and the story of his love, Sarah. I liked this story a lot. The duality between the two plot lines was interesting to me. Oscar would recall something between him, Reyes and Sarah and it would be reflected in the present time actions of Pierce’s and Mia’s escape. It was really great to see how Oscar builds trust and friendship with Reyes, and how heavily both Oscar and the girls depend on him. Escaped is well written, fast paced and rich in details. It gives more history, and more insight into what’s going on, and why Pierce and Mia are so determined to escape from Dorian. Oscar is a great narrator, and a good protagonist who only wants to have the people around him safe. Be it two people younger than him, one who he’s madly in love with–two people that Oscar is willing to protect from their own father, or two younger girls, one who is so much more than she seems. He’s a strong character, and one that I enjoyed reading about. His final actions and request and the end of this novella made me tear up. Despite the length of this, I really felt a connection with Oscar. I would like to know more about Reyes especially since he’s so much of a ghost character in Pierced. Oscar was the only child of a doting mother and father. A privileged boy of Spanish and Mexican descent, Oscar lived most of his life in Spain. Traveling overseas to attend New York University, h I was so excited to read this novella! In the first book, Pierced, we learn about a man named Oscar; however, not much insight is given into his character. In this novella we get to know Oscar. Further, we delve deeper into Pierce's world beyond the walls of the vampire compound. And what a world it is! Oscar was the only child of a doting mother and father. A privileged boy of Spanish and Mexican descent, Oscar lived most of his life in Spain. Traveling overseas to attend New York University, he becomes enthralled with the city. He also falls for a young woman--a woman too young to become his wife, so he must be patient. He builds his life with her as the foundation. Until he discovers that sometimes life has other plans. Such a great story! I love this writer! The plot, characters, and the depth of feeling in her work is limitless. I cried, I sat on edge of my seat, and I was transfixed on what was going to happen next! My heart ached, but it was just so good! A truly amazing story, thoroughly complete for a novella, this is a must read! But only after you read Pierced! Torn between two and three stars. I do want to make a plea to the author PLEASE PLEASE PLEASE change the story lines about Put Bulls being out of control killers who attack wounded animals. It isn't true, it's heartbreaking to perpetuate a myth that results in courageous, devoted being killed and mistreated. I have rescued Put Bulls that had been used for fighting, they would die defending family yet let other animals walk in them, play with them, or growl at them, without responding other than Torn between two and three stars. I do want to make a plea to the author PLEASE PLEASE PLEASE change the story lines about Put Bulls being out of control killers who attack wounded animals. It isn't true, it's heartbreaking to perpetuate a myth that results in courageous, devoted being killed and mistreated. I have rescued Put Bulls that had been used for fighting, they would die defending family yet let other animals walk in them, play with them, or growl at them, without responding other than to look for a command from the person they love. I would give up on many other authors for a terrible mistake like that, I like these books, and I appreciate the personal attention the author gave me when I had problems downloading this book. Off my soapbox now. This is a stand alone story in a lot of ways, although confusing if you hadn't read book one I imagine, in the beginning at least. I was saddened to see it was written from the point of view of another character, then I learned to live this one, as well. I'm not a fan of vampires as a rule, I will read this whole series, I do enjoy the twist on the whole thing. I always worry when a book has a young person in it, most authors do a crappy job of writing for kids, this one again breaks from tradition in s child who doesn't come across as false. 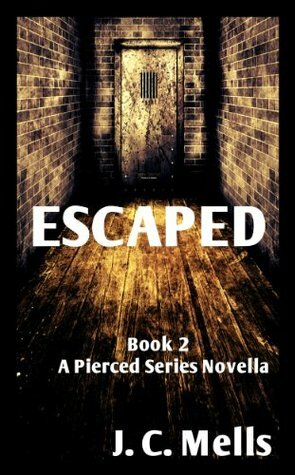 Escaped is the novella follow up to Pierced which is an absolute must read. So many linger questions from Pierced have been answered. This book centers around Oscar Alvarez de Sevilla, who we know helps Pierce and Mia, and his relationship with Reyes. The story is told in flashback from when Oscar and Reyes first meet and in present time as he helps Pierce. What the story lacks in length it makes up for in its contents. The richness in detail of provides us with a deeper understanding of Pierce Escaped is the novella follow up to Pierced which is an absolute must read. So many linger questions from Pierced have been answered. This book centers around Oscar Alvarez de Sevilla, who we know helps Pierce and Mia, and his relationship with Reyes. The story is told in flashback from when Oscar and Reyes first meet and in present time as he helps Pierce. What the story lacks in length it makes up for in its contents. The richness in detail of provides us with a deeper understanding of Pierce as well as to experience her from a different point of view. The love, pain and relationships Oscar has in his past that carry on until his death brought me to tears. J.C. Mells had me hooked at Pierce, but her follow-up novella, Escaped, has guaranteed me as a complete fan now. Word of warning, If you have not read the first book in the series, then hold off reading Escaped until you do. So much many questions are answer that it will spoil Pierced for you. However…both books are easily the best I have read this year. Counting the days until the next release! I received this book from JeepDiva in exchange for my honest review. The opinions and rating of this review are solely mine and in no way was I compensated. I liked book 1, but thought this one was better. I know it is a novella, but it so helped to explain a few things. The sad thing is that I really liked Oscar, yet we knew he was not going to be around long term as we learned that in book 1, and I wished he could be. This book is told from Oscar's viewpoint, but you not only get what happened with the escape, but also a look into his life before he met the girls and what shaped his life and the decisions he made before he died. He was a young man I liked book 1, but thought this one was better. I know it is a novella, but it so helped to explain a few things. The sad thing is that I really liked Oscar, yet we knew he was not going to be around long term as we learned that in book 1, and I wished he could be. This book is told from Oscar's viewpoint, but you not only get what happened with the escape, but also a look into his life before he met the girls and what shaped his life and the decisions he made before he died. He was a young man in college when he lost his parents, his only family, and yet he thankfully had Sara and Reyes to help fill the gap. He met them while going to school in NY. They didn't lead a charmed life so spent a great deal of it with Oscar. When tragedy strikes again and he loses his second family, Oscar makes the decision to work for Dorian. One that he realizes didn't make his life better and that he was not the man Sara would be proud of. His hope for redemption was to get Pierce and Mia away from Dorian and on to a better life. Even one that meant they were running for a long time. 'Escaped' is a novella from the POV of Oscar, the man who orchestrated the escape of Pierce and Mia whose story after this escape begins in the novel 'Pierced'. There are details in this novella that make it important to read the novel first so if you haven't read it I'd recommend it before you pick this up. I loved the novel so much that I picked this up and read it right after. The story is split between Oscar's past which includes a love story and details his relationship with Reyes, and the s 'Escaped' is a novella from the POV of Oscar, the man who orchestrated the escape of Pierce and Mia whose story after this escape begins in the novel 'Pierced'. There are details in this novella that make it important to read the novel first so if you haven't read it I'd recommend it before you pick this up. I loved the novel so much that I picked this up and read it right after. The story is split between Oscar's past which includes a love story and details his relationship with Reyes, and the story of the escape. Both stories build in tension quickly and I found it impossible to put this book down. I really enjoyed Pierce's POV in the first novel so I wasn't sure I'd enjoy this as much but I wanted more and the second book isn't out yet so I grabbed this and I'm so glad I did. This was just as excellent as the novel, with a gripping and emotionally powerful storyline that gave background on Oscar and Reyes both. Add-on novella to the Pierced series. I would suggest reading Pierced (Book One of the Pierced Series) regardless of whether you do that before or after reading this novella. This one depicts events that take place before Book 1 so in that sense it is a prequel, however from a pure plot and character point of view I would read it after.A prologue or short description to explain how the two books work hand in hand would perhaps be helpful for someone who hasn't read the first book. It gives us mor Add-on novella to the Pierced series. I would suggest reading Pierced (Book One of the Pierced Series) regardless of whether you do that before or after reading this novella. It gives us more insight into the characters of Oscar and Reyes the two people that help Pierce and Mia escape. I loved Pierced, for the most part because of Pierce, but even though this book was narrated almost exclusively by Oscar, I came to love him as a character very quickly too. J.C. Mells has a gift for voice; I could hear Oscar in my head, down to exactly what accent he would have, within a page or two. His personality is very different than Pierce's, but no less compelling. The plot is much tighter than Pierced's was. It is mostly told through two intertwined narratives that move forward together, I loved Pierced, for the most part because of Pierce, but even though this book was narrated almost exclusively by Oscar, I came to love him as a character very quickly too. J.C. Mells has a gift for voice; I could hear Oscar in my head, down to exactly what accent he would have, within a page or two. His personality is very different than Pierce's, but no less compelling. The plot is much tighter than Pierced's was. It is mostly told through two intertwined narratives that move forward together, separately until they end up meeting at the end. It's brilliant, and it pulls you forward in an even more intense way than a single, linear story would have done. Not to mention that there was set-up in Pierced that pays off in Escaped, even though Escaped tells a story that takes place before Pierced does. It's complicated--in the best way. My favorite kind of read. I really am glad that I read this novella... I loved getting to know Oscar. This is written from Oscar's POV and we get to know who he was before he got involved with the vampire compound. We learn about Reyes his trusted friend and the details of their past. The novella switches back and forth between the escape from the vampire compound to Oscar's past. I really do love this author and her writing style. Even though I already knew they escaped... I was still on edge! Can't wait for book two! R I really am glad that I read this novella... I loved getting to know Oscar. This is written from Oscar's POV and we get to know who he was before he got involved with the vampire compound. We learn about Reyes his trusted friend and the details of their past. The novella switches back and forth between the escape from the vampire compound to Oscar's past. I really do love this author and her writing style. Even though I already knew they escaped... I was still on edge! Can't wait for book two! Read Pierced first before you read Escaped... I feel like the novella might spoil a little of the mystery of book one. It is very well written and gives more depth to the story of Pierced. Great series... highly recommend to paranormal fans who are looking for something different and edgy. This book gives Oscar's side of the story. It tells of his life when he was younger, when he got to know Sara and Reyes and then it tells of when he helped Pierce and Mia. You need to read the books in order so as to get all the story, no good reading this on it's own. This is only the 2nd book I have read of J.C. Mells and so far I am loving them. I'm not really into vampire stories but this has just a touch about them and I'm off to read the next book. I have no idea why but these books keep me reading way into the wee hours of the night! I really enjoy the layout, plot and story telling. I find this series to be fantastic, even if I find them a little too short. Awesome novella with expanded information about a integral character, Oscar, from Pierced (book #1 in The Pierced Series). I loved this book just as I loved Pierced. A joy to read and did not disappoint! I enjoyed getting to know Oscar in this novella and to see his take on Pierce and Mia. There was just the right amount of history and insight. As I said in my review of Pierced, there needs to be a bit more editing. The story was very good, but the editing...not so much. Great story and it fills in details left out from Book 1 (Pierced). It really helps us know Oscar and Reyes and provides a depth of characterization that we couldn't get in Pierced. My only complaint is - too short! A very insightful novella on how the characters got the the point where they were. If you haven't read pierced yet.. Wait to read this one so you know what's going on during this book. Nice short story about how Pierce escaped, and you get to meet Reyes and Oscar. I liked the detail and filling n of the gaps from book be. Also fleshed out characters and introduced new ones. Great second edition to the series. The first in the series 'Pierced' was so good I immediately bought this and the third in the series. Hope the others are as good as this. Loved it, very interesting to read from Oscar's pov and see some of his backstory. Also nice to get to know Reyes a bit and can see that Pierce should trust him. Can't wait for Pinked to come out. I wasn't expecting the POV in this novella, but it totally works. Boy, a lot of things make sense now. I like how J.C. has explained, yet added to the storyline. Amazing! The story in Escaped is not to be missed! You HAVE to read it before starting Pinked. Have to, have to, have to! Don't miss them all. They are AWESOME. Loved this one as well!! It was great getting the back story on the characters. Helps the reader understand how Pierce & Mia got to where they are. I grew up in the Middle East (Abadan, Iran) and Spain (Fuengirola, Costa Del Sol) and finally ended up finishing High School in England (Weymouth, Dorset). I emigrated to the United States in 1990, and returned to school at the ripe old age of 28, where I obtained a BA and then t I have had every job from an ice cream truck driver to chocolate factory worker to waiting tables in a Las Vegas casino.